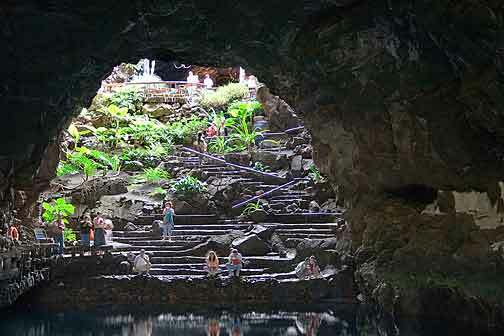 Jameos del Agua, as well as the Cueva de los Verdes, is located within a volcanic tunnel, created by the eruption of Volcano called “La Corona”. It is found in the part of the tunnel closest to the coast. Its name refers to the existence of an underground lake, a very unique geological formation. It was created by a process of filtration, as it is located below sea level. The tunnel, formed by the eruption of the volcano La Corona, is one of the largest in the world, at some 4 miles in length. The partial detachment of the ceiling of a section of the tunnel forms the structure known as a “Jameo,” (a term of native origin), which in fact no more than an opening in the ground which allows access to the various caves. 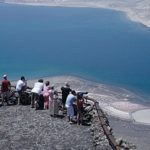 Four miles of tunnel extend from the volcano’s crater all the way to the shore, where for nearly a mile it continues underwater in what is called the “Tunnel of Atlantis” (Tunel de la Atlantida). 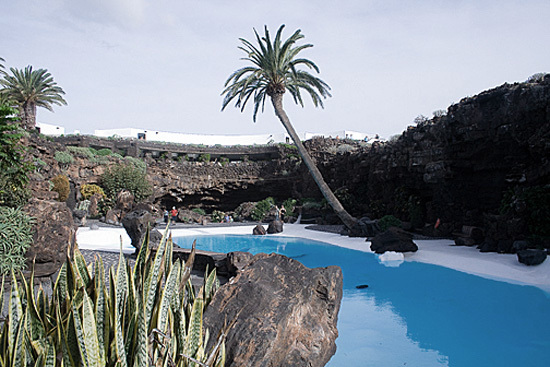 The Jameos del Agua is the first Centre for Art, Culture and Tourism, created by Cesar Manrique. Reflecting on one of its creative pillars: Harmony between nature and artistic creativity. Due to a certain level of abandonment, in the early 1970’s this site had to undergo extensive cleaning and reconditioning. The first phases of this project were opened to the public in 1966. 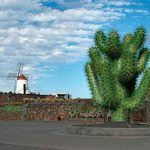 The Jameos del Agua in their totality can be attributed to Cesar Manrique. However, the project’s complexity and the numerous trips of Manrique to New York made it necessary to delegate much of the work to one of his closest collaborators, the artist Jesus Soto. Especially during the early phases of the tunnel’s adaptation. Soto was the creator of the spectacular lighting and adaptation of Cueva de los Verdes. Here, abundant vegetation stands out as well as the ornamental elements that enrich the visual impact of the Jameo’s structure. A beautiful restaurant has been integrated to this area. If you wish to enjoy dinner in this fantastic place, then Jameos Nights – Dinner and concert in Jameos del Agua with a special menu is the best option for you. This event combines music and culinary delights in order to enjoy a magical evening in this very special place. For more information and tickets click here. Inside you’ll find a natural lake with unusually clear and transparent waters. This space, having received very little adaptation, conserves the structure’s barrel vault shape. On sunny days, due to a hole in the upper part of the vault, a beam of light is projected overhead, extending towards the depths of the water. 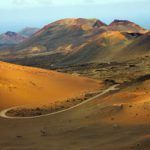 The “Small Jameo” is part of the first phase of the Jameos de Agua adaptation project which, run by the Lanzarote Government since 1966. A project focused on the adaptation and revitalization of emblematic spaces of the island’s geography. 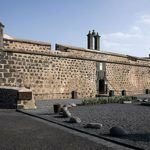 Originally, the Jameos del Agua site was conceived as a venue for shows and events: from that period you’ll notice the bar, the entrances and the marble dance floor. This underground aquatic habitat is home to a rich animal life. More than a dozen species of great scientific interest are found here. The most famous is the celebrated blind albino crab (Munidopsis polymorpha), which populates the rocky depths of the lake. 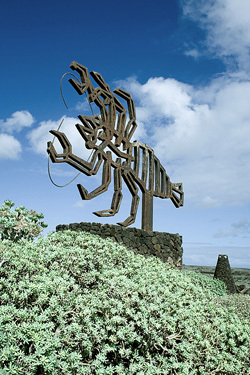 This crab has become the symbol of Jameos del Agua. At some point, you’ll come across a footbridge, blended into the environment, which allows you to cross the lake lengthwise. After ascending past a landscaped wall, you can access the “Large Jameo”. The ingenious artistic treatment of this area really makes this section stand out from the rest. Your senses will take in an exuberant and exotic garden with lush vegetation including palm trees, cacti, croton shrubs and fig trees, all surrounding a curvy pool of intense blue waters. The rounded walls of the jameo add to this picturesque space. The white smooth pool contrasts with the dark, rugged rocks, and you’ll feel you’re in a true underground oasis. Especially remarkable is the 100 years old palm tree which, hanging above the pool, provides a pleasant shade. Continuing past the “Large Jameo” you’ll come across another impressive installation. A spectacular Auditorium, opened in 1977, takes full advantage of the interior of the volcanic cave. The auditorium offers a fantastic architectural epilogue to your tour. 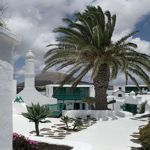 Without a doubt, the Jameos del Agua represents one of the most original works of Cesar Manrique. A truly magical and personal piece among his broad and unconventional portfolio. Recommended hours: Early from 10.00 to 11.00 or in the afternoon from 15.00 on. Your visit will be much more relaxed at these times. This Manrique masterpiece is thus taken in with greater serenity. How to complete the day? 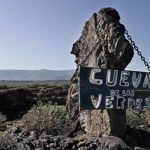 If you go and see Jameos del Agua you also should get to know the Cueva de los Verdes. They form part of the same lava tunnel, but the inside is very different. It is close by, you will get there in about 5 minutes by car. For lunch you could go to the nearby village Arrieta, for example to the quite famous restaurant El Amanecer. And if you are travelling with kids, you could enjoy a nice visit of the Pardelas Natural Park in Orzola, which is about 15 minutes by car. As you see, there are many different options. Enjoy this very special island!